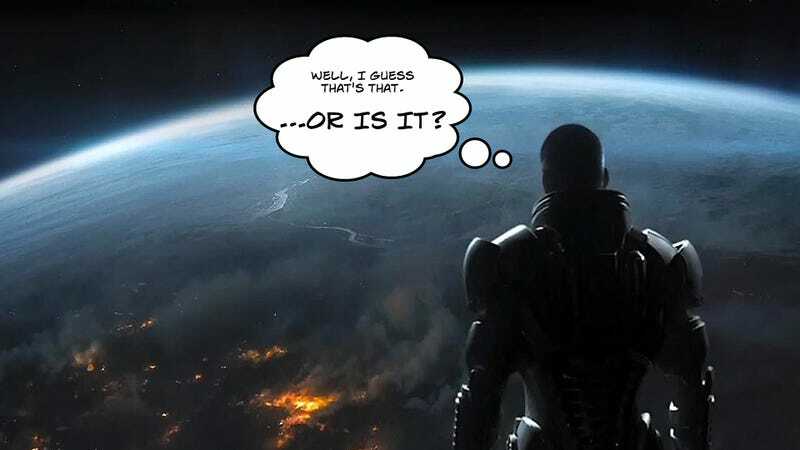 While speaking with Gamerzines, Mass Effect producer Mike Gamble suggested that "it wouldn't be a bad idea to keep your ME3 saves." "Obviously I can't say anything," he said, "but it wouldn't be a bad idea." Rock, Paper Shotgun's John Walker had some fun with this, floating theories about the meaning behind Gamble's statement—perhaps the save-game code contains some Great Untold Secret! Perhaps it is because the code has become self-aware and this would be tantamount to murder! Maybe this calls for a more detailed analysis of Gamble's language. After all, "It's not a bad idea to keep your saves" is different from "It's a good idea to keep your saves." It's not a bad idea—if it were a bad idea to keep your saves, Gamble would have warned us. Therefore, we can conclude that it is safe to keep our Mass Effect 3 saves, that they won't corrupt or destroy our hard drives. Also, is it ever a bad idea to delete save games? Maybe he just means that it'll be good to keep in them in case we ever want to play Mass Effect 3 again. Or, you know, it could just be that EA and BioWare are planning to make more games in their hugely successful, rapidly growing video game franchise rather than arbitrarily ending it forever after the third game. Time will tell!